These albums are rich in color and style, and are highly customizable. Each photograph is “flush” mounted on bookboard with no visible edge. This gives you the option to create stunning panoramic spreads. There are no limits on the design layouts; you can see many examples of layouts in the design portfolio. 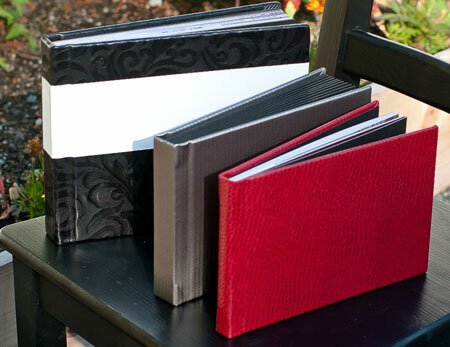 Covers can be made of leather, silk, bookcloth, and more. 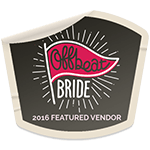 If the wedding album you’re imagining in your head has that square and substantial look, with generous borders are the photos, you’re probably thinking of a matted album. 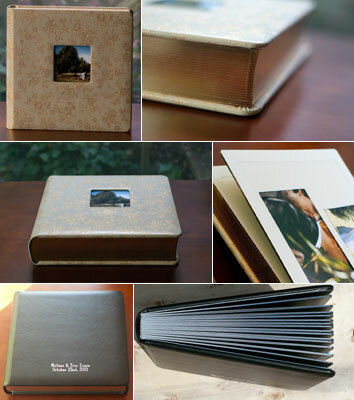 These are very large traditional albums that are wrapped in leather or fabric and contain individually matted photos. Choosing a matted album will give you a very classic look and feel, but they also come in non-traditional colors if you want to spice things up. Not your grandmother’s wedding album, but more contemporary styles are available, including a hybrid matted-flush album that can transform from vintage to modern.